If you have any comments or bug reports, please use our feedback form. SongHawk is an application to provide statistics about the contents of music libraries and gather additional information about the genres, artists and albums contained in those libraries. Recommendations: Artists you may like based on similar artists to those in your library. Rankings: The top ranked items in your library based on playcounts, song counts and track durations. Further Information: Additional information about the genres, artists and albums in your library. Statistics: Various statistics about the contents of your library. 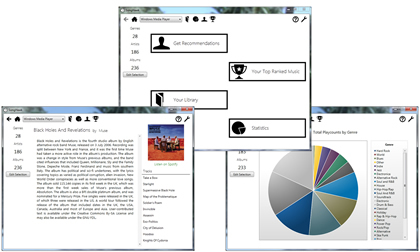 SongHawk was created as my individual project during the final year of my undergraduate masters degree in Computing from Imperial College London. The purpose of the project was to add additional value to the data found in music libraries by providing statistics and additional information, as well as evaluating the suitability of F# for this type of application.